Happy Friday! As we inch closer toward the end of October, I’ve got more Halloween-inspired polishes for you! 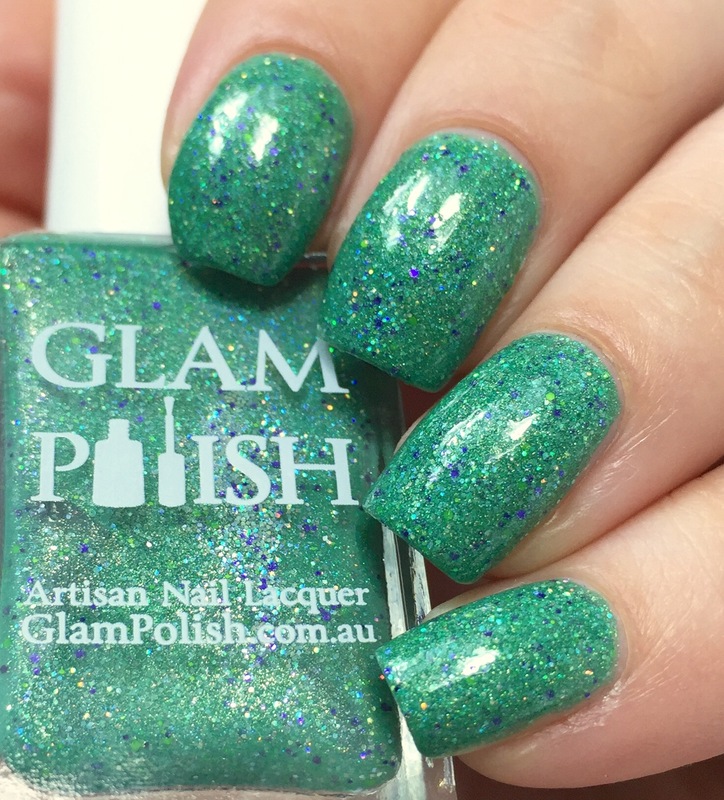 This green sparkler is “Frankenslime 2015,” the third iteration of the Frankenslime Halloween LE from Glam Polish. 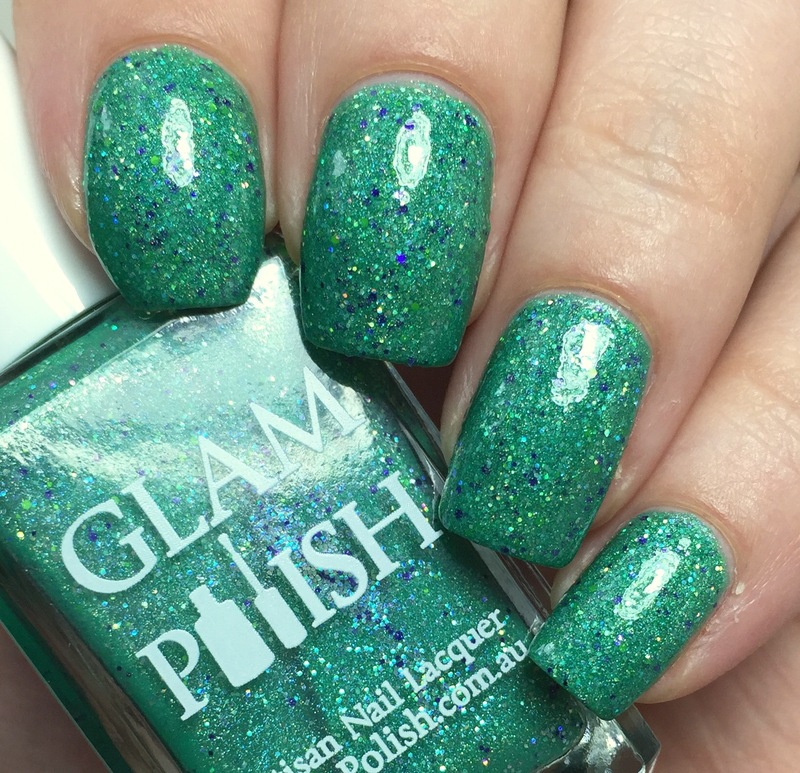 This is my first ever Glam Polish- I saw it in a blog and I am straight-up weak to green polishes, so I knew I had to have it in my life. As you can see in the macro, Frankenslime is an emerald jelly with scattered holo particles and tiny holo glitter. There’s also lime green and purple glitter in varying small sizes. The end result is a fun mix-mash (monster mash?) of colors and sparkles. The formula is nice and opaque. I used two coats for full opacity, plus two coats of top coat (it does dry a little gritty from the glitter). The coats took just a little bit longer to dry than I am used to, which isn’t that unusual for some jellies (I am so spoiled by insta-drying holos). This was super difficult to photograph. My camera was confused and most of the pictures showed a distinct internal monologue of “what do you want, lady?! Holo or glitter or color or detail- which is it? !” (Does everyone think their electronics have an internal monologue?) I did finally manage to get some good shots, though, so soak in those glorious details. To be totally honest, it wasn’t just my camera that had problems- my eyes weren’t even sure how this polish pulls of its look. 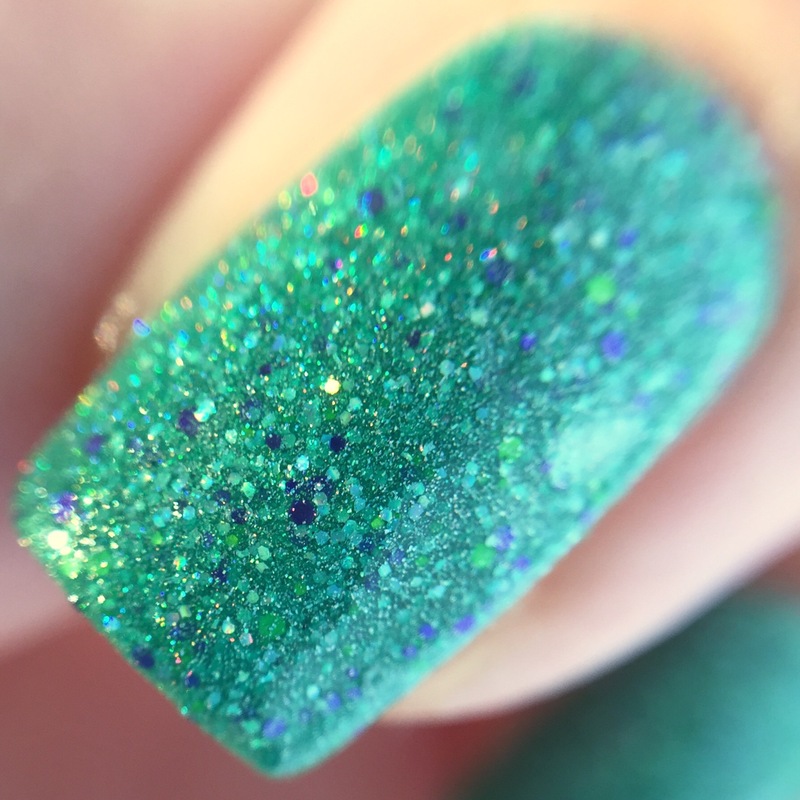 I couldn’t tell if the holo was from microglitter or scattered particles until I saw the macro. As I mentioned, this is my first Glam Polish purchase. They’re based in Australia, so I had been wary of shipping costs. Turns out I needn’t have feared- they have a US warehouse that they ship out of (in MI, for anyone curious)! From purchase to my house took less than a week. I was also super excited about the wide selection of in-stock colors. I spent at least an hour meticulously comparing different shades from my wishlist and narrowing down (and adding to and narrowing down again and adding to) my shopping cart. Their polishes all look so good on their site that it’s hard to choose! I just checked, and it looks like “Frankenslime 2015” is still in stock (yay!) 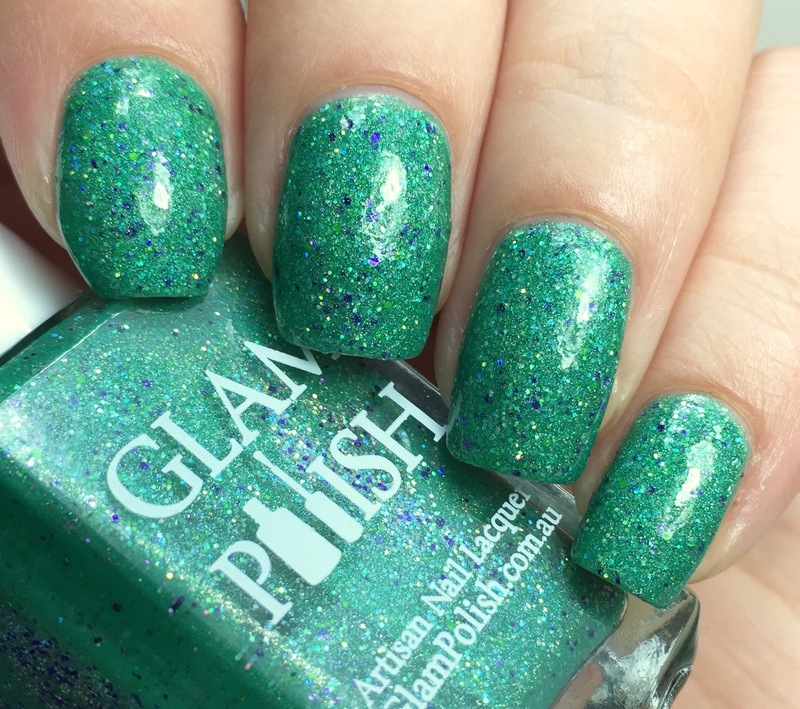 on the Glam Polish site, so it looks like you’ll have time to get it in your hands before Halloween! I actually just made my first Glam Polish purchase and this was part of it. I can’t wait to get it! I love Glam Polish and this colour! It’s beautiful! Hey my camera iften has the same internal monologue!! Haha loved that. The swatch is beautiful!! Such a fantastic shade of green! It is beautiful on you! This might be enough to make me like greens.